Why’d she have to go and make things so complicated? Canadian pop-punk princess Avril Lavigne is no stranger to the headlines, having just married Chad Kroeger of Nickelback, nor is she a stranger to the charts. However, at least for the past few years, single and album releases from her have felt like a non-event; something that should wake up the public only to stall out and fade away, now locked up somewhere in the top 40 graveyard. Here comes a delayed fifth full-length effort from her, self-titled, which accurately maintains her teen queen image (strengths and the weaknesses) but also shows some needed growth and variety in musical tastes. This one will fly under the radar, but it could be the best music she’s put out in years. One of the first highlights is “17”, a fun and bouncy pop number reminiscing about a time when “we were livin’ so wild and free” and “it was you and me/We were living our dream/And we were 17”. The track was co-written with Martin Johnson and Jacob Kasher, who were also involved on first single “Here’s To Never Growing Up”, but this is the stronger of the two songs. It certainly holds more substance; it’s cute without being juvenile and would have performed better at radio as the leadoff single if given the chance. That was a major mistake on Epic’s part, and unfortunately, both the label and Lavigne have paid a bit for it. Also ranking high on my list is track six, “Give You What You Like”, co-written with Kroeger and David Hodges. The darker, more understated song about a girl questioning the notion of love and her commitment to it plays nicely off an arrangement of guitar, hand claps and tambourine, as Lavigne tempts her counterpart: “I’ve got a brand new cure for lonely/And if you give me what I want, then I’ll give you what you like.” This one is better left as album material, but it wouldn’t sound out-of-place on 2004’s Under My Skin, which may be my favorite album from her. The tone of it is really likable and her character is strong. Elsewhere, “Bad Girl”, featuring a guest appearance from Marilyn Manson, radiates shades of Blondie and Joan Jett and the Blackhearts. By far the hardest sounding track on the album, it’s the flavor that counts. “Hello Heartache” seems to be a fan favorite, which I also enjoy, a mid-tempo record in which Lavigne takes a few vocal risks and the more experimental nature of it makes it a standout. Finally, there’s “Falling Fast”, which is fairly textbook, a vulnerable acoustic-sounding ballad that builds gently as she sings, “Let’s take a chance/Take it while we can/I know you feel it too/I’m falling fast.” Straight out of the late 90’s, it can easily be compared to similar tracks in Alanis Morissette or Sarah McLachlan’s catalogues. Unfortunately, this album also suffers some major missteps along the way. Cue “Hello Kitty”, track eight, which indeed proves that curiosity killed the cat. The “Gangnam Style” turned trashy dubstep number is loaded up “like a fat kid on a pack of Smarties” and I have no words, except perhaps that a Japanese audience will probably eat this up. After all, she has a significant fan base in that part of the world. The unnecessary cursing is also an issue on this one, just because it’s sounds so awkward. “Bitchin’ Summer”, I’m looking at you. Lastly, there’s the filler tracks – now granted, this was supposed to be released at the end of summer and maybe I would’ve given songs like “Sippin’ On Sunshine” a pass then, but that and “You Ain’t Seen Nothing Yet” bring the lineup down as a whole. I’m surprised there weren’t other considerations when it came to compiling a track listing. Despite the lackluster tracks, I’m pleasantly surprised with how Avril Lavigne turned out. There’s a charm on this album, at least more so than on 2007’s The Best Damn Thing or 2011’s Goodbye Lullaby. However, it’s way too late to repair the damage of those two eras when it comes to the numbers. 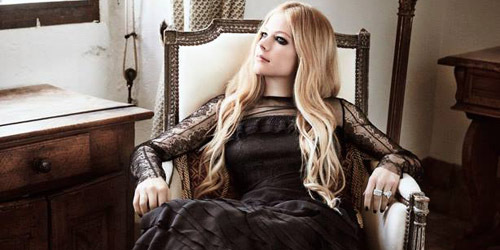 Lavigne’s audience has grown up, and though she has her moments of maturity, it can be lost considering its first two singles were childish and ran their course without making a significant impact. Couple that with the fact that Epic’s radio department has shrunk significantly this year and a general frustration of the record group from even its own acts like Cher Lloyd and Karmin and this will likely be an effort that fades from the charts pretty quickly. Nevertheless, it is one of the singer’s stronger albums to date, so I do wish her the best. Perhaps current single “Let Me Go” will act a rallying cry from the singer; after all the push backs and singles indecision, she deserves a better team behind her. Listen to Avril Lavigne on BCharts. / Pre-order Avril Lavigne on iTunes. I couldn’t agree better. Avril has different songs, style… I don’t really know if she really wants to be at the #1 charts, but I believe she has some amazing songs that can be as successfull as Katy/Gaga’s. I don’t know what happenedd with the team behind her over the past years, they seem to put all the good songs down. If they released Falling Fast or even Sippin’ on Sunshine as first single, it would have put this album on another level. Actually, people may say Hello Kitty is like, different from the rest of the album, but the 2 worst songs are definitely Rock n Roll and Here’s To Never Growing Up. But, after all, it’s all Avril on the 13 songs and I believe the fans will be very, very satisfied. That’s what matters, right?! Let’s not even get started on the MAJOR musical catastrophe of not only not releasing ‘I Will Be’ as the hit single it would have become, but also the fact that it wasn’t even put on her ALBUM. Katy Perry stated that EVERYBODY in the industry wanted that song, but apparently not the writer, Avril. It’s one of the best songs of the last decade, so if I don’t find anything worth listening to on this new album, I’ll be searching the web in the coming months for its unreleased tracks. As much as I love her, she’s never been as good without The Matrix (who made her, let’s face it). Dr. Luke and Max Martin were a definite help to her in 2007 but since then she’s sort of ditched them yet again for her more favourable team – hubbie Chad. Which I don’t get. But hey, at least ‘Let Me Go’ is melodic and strangely beautiful. I just like Avril because of her amazing pop mid-tempo ballads, which she needs to stop ignoring as opportunities for major hot 100 material. God I’m not even in the music industry and I know how to do their jobs better than they do! Hello Kitty is ka ka ka ka waiii desu ne! Now I imagine walking @ Shibuya where many establishments playing this song. Total kawaii for us Japanese fans and Asians. I think that Avril sounded best when she worked with Butch Walker. It’s a shame that they’re no longer friends. “My Happy Ending” was quite possible her best song ever. She really needs to lose the bratty teen skater girl sound – she’s not 16 anymore & that kind of music doesn’t sell these days. I am looking forward to hearing her new album though – “Let Me Go” reminds me a lot of something that would be on Under My Skin, which in my opinion is her best album to date. I totally agree with you, I still don’t know what’s of her, and the label, they ruined what would’ve been a perfect good album, (I think I’m overreacting) but, like the critics said when Let go was released, they should had released I’m with you, then complicated, it would had givin it a more mature touch from her, same happened here, they released the more childish ones, at less they shouldh gave it a try with 17, don’t know who is in charge but they are retards, also I don’t know why people hate her so much. Loved the country touch tho. and I want Chantal kreviazaku and the real david hodges back. I really feel like the only thing she can do is immediately scrap the current singles, and launch with one of the acoustic numbers for the winter like ‘Falling Fast’, ‘Hello Heartbreak’, or even an empowering one like ‘You Ain’t Seen Nothin’ Yet’. There’s a vulnerability to this project that I absolutely love. She may be 28, but I think she’s covering material that most of us at this age struggle with (Minus the whiny subjects of the singles so far). The heartbreaks, the loss, the growing up. This may be one of her strongest projects to date, and I think it flows beautifully out of 2011’s ‘Goodbye Lullaby’. I really hope Avril promotes the record properly. This is the album Katy Perry should’ve made, yet somehow her collection of radio fodder is landing at #1?